Written by Melissa on March 25, 2015 in Development. 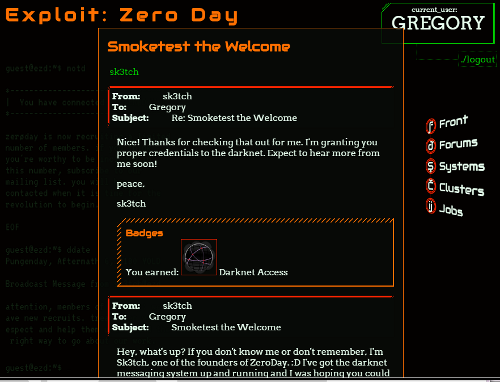 Exploit: Zero Day — our in-progress cyberpunk puzzle game — now has all the features it needs for the kinds of stories we want to tell. We have a lengthy list of story ideas that we'll be implementing over the next many months of the game, but here are a few that typify the kinds of narratives we want to tell. The scale of these varies, but that flexibility will help us create a rich world; not every story needs to be a epic trilogy. Samsara Digital presents a unified, impenetrable facade to the world through concerted PR efforts. After Samsara publicly denies their involvement in the third bank collapse this year — all three supposedly protected by Samsara's Cyber Liberation Digital Liability Policy — a quiet voice from within the company puts a call out to Zero Day for help. They suggest you look at a specific department for answers that go against the grain. If this group is legit, how are they staying hidden? Given a former employee's credentials, head into a subset of Samara's systems and discover what you can about these banks and whether Samsara is involved in their collapse. Will you divert and discover more about this department? If you discover who they are and what they do, will you out them, despite them setting you on the trail on the banks? War has broken out in a small, resource-poor country, and both sides have corporate backers providing mercenaries. Why are these companies bothering? KernelPop, former Samsara employee and early Zero Day member, has a strange fascination with small countries' wars, and asks you to take a look. Pick one of the companies or the rustic government computers of the country itself to gain access to and discover their relationships to each other. Will you contact the press with what you find out? Help one of the companies win? Find help for the country from another source? The affable KernelPop managed to forget some important personal files when he left Samsara in a hurry... but he's not exactly sure where he stashed them or if they've been moved. Who wants to go spelunking? Finders, keepers, so long as he gets a copy back. You have a contact who can get you initial access... if you're willing to do them a favor. The larger the favor, the better the starting point, but they'll call that favor in some day. Once you have access, explore from the starting point you've earned and hope that the files KernelPop left behind aren't being monitored too closely. Get in on the fun — sign up for the Exploit: Zero Day newsletter for an access code when the next mailing goes out. Last update on March 25, 2015 .